With winter in full swing, prepare for storms of ice, snow, and bitter cold. This year, the Federal Emergency Management Agency released an updated How to Prepare for a Winter Storm Guide. 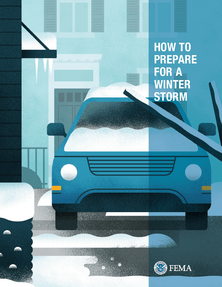 The guide includes a preparedness checklist, tips to stay healthy and warm, and a winter weather check for your car. There are also actions to protect your home and reduce property damage. Visit the website for more winter preparedness resources.